Delegates of the first-ever youth synod of the Evangelical Church in the Rhineland. 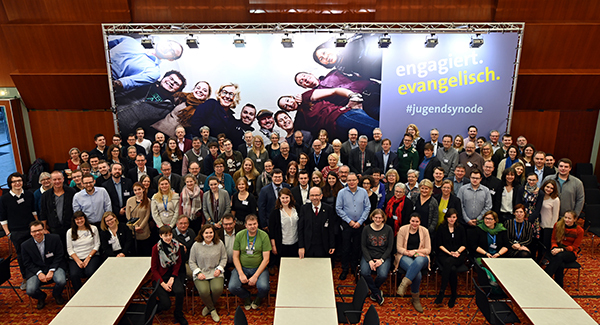 President Manfred Rekowski and Fiona Paulus, vice-chair of Evangelical Youth in the Rhineland, have given positive reviews of the first-ever youth synod of the Evangelical Church in the Rhineland. “It was an unbelievably good experience of working together, on equal footing. Each delegate was able to share their opinions and be taken seriously by the others,” Paulus said at the press conference on Sunday afternoon in Bad Neuenahr. At the end of the youth synod, delegates crystalized their discussion and consultation into five resolutions for deliberation by the regional synod. The youth synod’s first resolution, on participation, deals with binding forms of participation by young people in the work of their local church congregations and in governing bodies. The youth synod has proposed to the regional synod to explore innovative models of participation by young people in five church districts during a three-year period. In addition, it is hoped that church districts will send more young people as delegates to the regional synod in the future. Further, all local church congregations are to commit to setting up youth committees, half of whose members are to be young people. In addition, the youth synod is advocating for guaranteed financial and human resources for work with children and youth in local church congregations. This was of particular importance in rural areas, where work with children and youth was becoming more and more difficult due to decreasing membership and geographical distance, the vice-chair of Evangelical Youth in the Rhineland explained. The youth synod has asked the regional synod to evaluate possible sources of support in the form of start-up funds, co-financing or fundraising. In addition, there is to be a required level of training and skills for all professionals working with children and youth. The youth synod is calling the Evangelical Church in the Rhineland to increase its engagement to tackle poverty among children, youth and families. Delegates have proposed that, among other initiatives, local, low-threshold service centers are set up to advise and support children, youth, parents and families. “At the moment there are many centers and each much be accessed separately; this is a threshold that makes it difficult for many to get support,” Paulus said. The resolution also takes a look at the Evangelical Church in the Rhineland’s own services. At points where contact can made with affected children and youth, ways must be found to reach people without making them into “petitioners”. As well as the above topics, youth synod delegates debated two regional synod exhibits and sent comments that will inform regional synodal sessions. The delegates were concerned in particular about the fate of unaccompanied refugee children. In a resolution the youth synod calls on local church congregations to enter into consultation with politicians ahead of European Parliament elections in May 2019 and to raise awareness of the particular vulnerability of these young people. There was much praise for the regional synod and for church leaders with regard to new parish forms. The youth synod commits itself to development of new parish forms. A total of 500,000 euro in start-up funding for pilot projects is to be made available each year for a set period of time. The regional synod now must decide on the details of financing, including for pastor positions, as well as on funding guidelines and a project coordination position. In addition, the youth synod has tasked the regional synod with ensuring the participation of young people and Evangelical Youth in the Rhineland in the grant-awarding committee. Rekowski admitted that the younger generation had been given too little space and opportunity to be involved in shaping the life and witness of its church up until now. The youth synod was a “strong signal” that this was to change, he said, adding that discussion with all parties would continue as to what forms collaboration between youth and the regional church would take in the future and whether there would be another youth synod. “We are committed to ensuring that the topic stays on the table permanently,” Paulus explained.